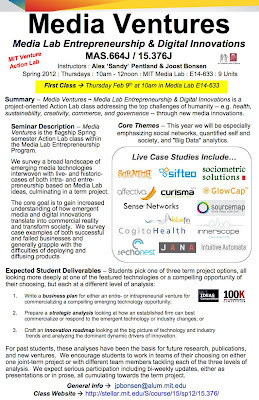 MIT Media Ventures ~ Media Lab Entrepreneurship & Digital Innovations Seminar is the flagship Spring semester "Action Lab" course within the Media Lab Entrepreneurship Program. We survey a broad landscape of emerging media technologies interwoven with live- and historic-cases of inter- and entrepreneurship-based on Media Lab ideas, culminating in a term project. The core goal is to gain increased understanding of how emergent media and digital innovations translate into commercial reality and transform society. We survey case examples of both successful and failed businesses and generally grapple with the difficulties of deploying and diffusing products and as a means of exploring a range of business models and opportunities enabled by emerging Media Lab and related innovations. This year we will be especially emphasizing personal health care, financial service innovations, mobile transactions, and social media generally with special focus on social networks, quantified self and society, and "Big Data" analytics. First class this Thursday morning February 9th, 2012 in Media Lab E14-633.